Sean Avery rushed to hospital / Dogs season ticket deadline TODAY. Sean Avery was rushed to hospital last night after suffering a lacerated Spleen. Not nearly as scary as the early reports that included cardiac arrest- but serious none the less. Today is the deadline to renew your Bulldog season tickets. The Bulldogs office will be open all day at the Multiplex until 6pm. Don't say you didn't know! If you don't renew, you will make many people on the waiting list very happy I'm sure. Don't forget to make it out to Boston Pizza today from noon to 2pm in support of Port Alberni Team Canada Olympian Travis Cross. Travis and his teammates and coaches will be serving lunch. Boston Pizza will be matching any tips Travis and the crew receive, in a further effort to cover for the costs of attending the Olympics in Beijing this August. Of course CBC will be there filming it all too. 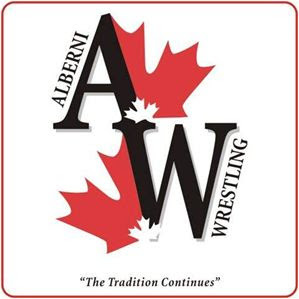 After the Wrestling Awards tonight at 7pm at Echo Centre, the final "to do" item on the list for CBC's visit is an interview with Travis and I tomorrow morning on THE PEAK morning show at 8:10am. Don't miss it! I'm a blogger and a hockey guy and as such I read a lot of other blogs. I haven't really posted before about this, so it is long overdue. I read an assortment of blogs. Some of them are about the BCHL. Sadly, as far as I'm aware, I am the only guy covering a Coastal Conference team that has a blog. If anyone is aware of another one, please let me know! Interior Conference fans are spoiled as they have some good blogs over there. I also read a good assortment of WHL blogs. The WHL isn't only a level of hockey and broadcasting I'd like to get to, but also a proven ground for the next up and comers in the hockey world. So it's a no brainer that I would read them. I read some NHL blogs as well, and the blogs of several other sports media types. I'm not much of a tech-head believe it or not, but I follow a little bit here and there with the "new" stuff. I know I wouldn't be where I am now and I won't move on to where I want to be in the future if I don't continue to try and be up to the latest technologies in covering the game and connecting with fans and potential future employers. Rod Pedersen's blog- I've brought it up before and I've said it before- Rod has my dream job or any sports guys dream job. He is the play-by-play voice of the WHL's Regina Pats and the CFL's Saskatchewan Roughriders. For those not too interested in those two teams, don't worry, there is plenty of NHL talk and sports talk, and just plain everything else. Last but not least- Rod's blog was awarded the 2007 Canadian Blog Awards BEST SPORTS BLOG. Nuff' said. Rod does an incredible job of covering the local scene and connecting those following from a distance- An example- A native Manitoban like myself, almost couldn't help but to cheer for the Roughriders against the Bombers in last year's Grey Cup. Manitoba used to be home, but that was a time ago. I knew a lot more about the Riders story and struggles throughout their year going into the Grey Cup than I did the Bombers. "Taking Note" with Gregg Drinnan- Gregg is the Sports Editor at the Kamloops Daily News. This blog probably has more news than you can handle! I first found of it's existence after the infamous "players sitting on the bench at intermission" incident here this season. Gregg reported on it, (word sure spreads far and fast, doesn't it?) and even linked it to an old hockey coach I watched growing up in Flin Flon- Normie Johnson. I emailed Gregg about the overblown "bench incident" and the local reaction here, and I told him about how I watched Norm Johnson coach the Flin Flin Bombers to their last Championship in 1993. Gregg emailed back and said "Hammond....You wouldn't be related to CAL, would you?" Incredibly small world!! Anyway- Gregg has great news reporting on his blog, and is right now doing a running history of every year of the Memorial Cup. Very cool stuff. Ted'sTake with Washington Capitals owner Ted Leonsis - EVERY pro team should have an owner like Ted. The Dallas Mavericks fans are the only ones as fortunate as the Caps and Wizard fans. Regan's Rant- Regan Bartel, play-by-play voice Kelowna Rockets. Regan does a great job there covering the local scene. His work with numbers and stats amaze me and give me ideas about the numbers I need to compile. Keen's Korner- Jon Keen , play-by-play voice of the WHL's Swift Current Broncos. Another great job covering the local scene enabling those from a distance to know what's happening locally. Engadget- Great for the tech news. Not really a blog though? Oh well. All in all, there's some great stuff on the NET besides things you SHOULDN'T look at while at work! Happy surfing! I would love to hear about any other blogs you check out, on any topic, please share them! Due to the amount of Google searches that end up at this blog looking for live NHL playoff action on the net and on Satellite Radio, I have decided to make this post to help some people out in finding what they want to hear. If you have a Satellite Radio and are looking for LIVE PLAY BY PLAY you need to have XM Satellite Radio or you are out of luck, as XM is the exclusive home of NHL play-by-play. I got myself an XM Radio just before Christmas, and for the SOLE reason that I could hear NHL play-by-play on it. Nothing else. Although I do enjoy all the other NHL coverage they have, I also enjoy "Laugh Attack" - all Canadian Comedy when I'm not into the Hockey Talk or there isn't any play-by-play to catch. Now- Sirius Satellite Radio isn't without NHL coverage. A post from Rod Pedersen's blog got me wishing I could have BOTH XM and Sirius as Sirius has "Hockey Night in Canada Radio" which I'm sure would be a very interesting listen. Here is the post that got me thinking about Sirius- from Rod's blog. Bulldogs Spring Camp, HUGE week for Travis Cross and Port Alberni as CBC Sports visit, Are the Penguins and Stars making NHL history? The Bulldogs Spring Camp is in the books. I had a busy weekend and didn't make it down there as much as I would've liked to, but when I got there the action was fierce. All the players returning from last year knew when they left at the end of February what they needed to work on when they came back to fight for a spot for next season. I am not sure if the team has had to make the tough decision to tell some guys they won't be returning but I would not be surprised if that was the case. Whether these players would be outright released or there would be an attempt to trade them I cannot say. I'm not sure that this is something a press release will come out about, so I'll see what I can find out from the team or the players themselves. As you all know if you have read this blog before, I'm not big on speculation and guessing, especially when it comes to the kids and their families. I didn't make it to the rink Saturday night because I was attending the "you thought you got away with it but you didn't" surprise 50th birthday party my good friend and partner in crime on Bulldogs home Broadcasts Rick Schievink. Helma did a great job planning this one, as they were gone on vacation when Rick turned the big 5-0, and he thought he would get away with not having a party. Not so Ricky. Saturday night about a dozen of us sneaked into the living room while Rick was preoccupied with hockey work in his office, and then we got the big SURPRISE in. Good stuff! Hammer's Mexican PinWheels were a huge success on the appie buffet! Here is the itinerary for the CBC visit to Port Alberni to shoot a feature on 2008 Beijing Olympian Travis Cross. Please get out and attend these events if you can, and don't miss Travis with me Wednesday and Thursday mornings on the 93.3 The Peak FM morning show ! You are invited to show your support for Port Alberni’s own Olympian Travis Cross. Come out and celebrate Travis’s accomplishments and show CBC and the rest of Canada what a great community Port Alberni is. Tuesday April 29 from 3-5 pm at Safeway – There will be an Olympic display with Cross t-shirts and decals for sale and Travis will be on hand to sign autographs and chat. CBC will be stopping by to film the great support Travis gets from our community. Wednesday April 30 from 12-2 pm at Boston Pizza – Come by and have lunch and get served by Travis or one of his teammates or coaches. All tips will be matched by Boston Pizza and will go toward Travis’s training expenses. Several people and organizations will be making donations. T-shirts and decals will be available. Hopefully the weather will be good and the patio can be open. CBC will be there to film all the community spirit and pride. In addition Travis and some of his supporters will be having breakfast at two of his most committed business sponsors the Swale Rock Café and Smitty’s Restaurant. If you want to stop by Tuesday morning at 8 am at the Swale Rock Café or Wednesday morning at 8:30 am at Smitty’s Travis and friends will be there. Travis will also be on ADSS’s ABC News at ADSS on Tuesday, speaking at Neill Middle school that same day, John Howitt Elementary on Wednesday and he will join the “Hammer” for the Wednesday and Thursday morning show interviews just after 8:10am on 93.3 THE PEAK FM. Travis, his family and his support team would like to thank the people of the Alberni Valley for your amazing support. He is proud to represent out community and our country on the international stage. He is working hard in preparation for the greatest event on earth, the Olympic Summer Games in Beijing China. All of your support and good wishes feed his determination and give him strength. Please pass this invitation on to your contacts as we really hope to have good turn outs for these events. Are the Pittsburgh Penguins and Dallas Stars making NHL history? Are they close to it, or have they made it already? I ask about the Penguins because they have started the playoffs with 6 consecutive wins. Not too bad. The Dallas Stars achievement is even more impressive in my opinion, in that they have now gone into TWO straight series as the LOWER seed, and after last night both times they have returned home with 2-0 series leads. I have tried to find that one out, but it might be for the Wizards at the Elias Sports Bureau to figure out....Has an NHL team ever gone into the opening two series as the lower seed and returned home up 2-0 both times? I know it's early, and I know that one team can look like they can't lose one series and like they can't win the next....But WOW does Dallas ever look good to me. Leadership, toughness, skill, composure, special teams, intangibles, goal tending, etc etc etc. Look out for the Stars! That's it for THIS morning. I will attempt to talk Satellite Radio and about other blogs I read later today. Yes, I have entirely too much time on my hands some times. It was a beauty day in the Valley yesterday, so as I went down to catch the camp I thought I might show off the rink and the valley a little bit. Click below to play. As good as I could get them with the windows behind me. It just doesn't look good like this- "The Pound" but without ice...It looked great with the wrestling mats in there, but maybe that's because I knew that there was ice underneath still! ...winning the Doyle Cup series in 5 games over the Penticton Vees. The Kodiaks also led the AJHL to the RBC Cup last year beating the Nanaimo Clippers. Bulldogs Corporate Wine and Cheese and Jersey Auction, Spring Camp ready to go. Hello and happy Friday and thanks for checking the blog. I had the pleasure last night of hosting the Bulldogs Wine and Cheese Corporate Sponsor night at the Best Western Barclay Hotel. It was great to see such a great turn out from the Corporate Community. I thought it was also a nice touch by the Bulldogs to have so many of the returning players in town for the camp this weekend to attend the night and meet some of the names on the back of their sweaters. It was odd seeing Alan Kerr, Bryant Perrier, and Jess Moser again. I say "odd" because it's weird seeing someone almost every single day from September to March, and then not seeing them again for a couple of months. From all accounts last night, the Spring Camp starting today will be very competitive and high energy. Most if not all of the returning players are back. They were told quite clearly at the end of the season what they needed to work on for 08-09, and how important this camp would be to gauge their progress and them being here next year. I think it will be interesting to watch. Again- the schedule is below, give it a look, and hopefully we'll see you around the rink this weekend. Here's to the thought that the progress made this weekend will enable the Bulldogs to be PLAYING this time next year! Playing tonight- The Penticton Vees and the Camrose Kodiaks. The Vees have their backs against the wall, down 3 games to 1. A Camrose win, and they book their ticket to the RBC Cup in Cornwall, Ontario. Sticking with the Bulldogs- This is the last weekend for the jersey auction. Click HERE for more information and get bidding. Also at the rink this weekend- A silent auction of a selection of autographed NHL and other sports pictures. Some of these were at the wine and cheese last night....Incredibly cool stuff. Johnny Bower, Jean Beliveau, Wayne Gretzky, Mark Messier, Mario Lemieux, Tiger Woods, and the list goes on. Some of these beauties are AUTOGRAPHED and they also come with a certificate of authenticity, so you know you are getting the REAL DEAL. In an unrelated story, my birthday comes up soon in May. Ahem. Don't forget the GOLD IN THE NET Golf Tourney Next Weekend. Sign up, and say that Hammer sent ya. That's it for today. Go Stars. Go Rangers. Round 2 Predictions, 2 former Bulldogs further careers, Dogs prospect camp upon us. Lets start first today with round 2 predictions. Good news about a couple of former Bulldogs furthering their careers. I've said it before, and will again, the team and the billets/supporters here should be proud when a Bulldog moves on, whether he began or ended his career here or even just stopped along the way. Every player will tell you that no matter how long you play somewhere, there is always someone in that situation that helped you out and played a part in them either getting settled in, getting better, or just making it through each day. Congrats first to Andrew Ella, a Bulldog for the 2005-2006 and 2006-2007 seasons before he was traded to Georgetown in the OPJHL after the end of last season. Andrew has received a scholarship to play at Nichols College in Dudley, Massachusetts for the Division III "Bison". Cool name! The school is about an hour out of Boston. Another accomplishment for Andrew came in the form of a playoff MVP award for the Raiders this season. Congrats to Andrew and family and all that helped him over his time here. You won't meet a nicer kid or a better family! Thanks to his old Billet mom Nancy Smeltzer for the heads up on Andrew. Of course Andrew scored one of the most memorable goals in Bulldog history- a double OT game winner for 18, yes EIGHTEEN wins in a row. Hopefully we'll see you around the rink! No 7th Heaven for this guy, review- The Argyle Pub. Well, two game sevens, and both of them went the opposite of how I wanted. I didn't just want the Flames and Caps to win because I was cheering for them, I also had big points on the line in my "Playoff Prediction Pool" I had the Caps in 7. That would've been huge bonus points. I had the Flames in 6. Even the right team would have netted me some needed pointage. My dad had the Flyers and Sharks.......curses.......Hopefully I can rebound this round. Too bad for the Caps. I thought they got jobbed a bit last night with the second Philly goal, and also with the goal being dislodged when they scored in the third period. No, the goal shouldn't have counted, but a delay of game should have possibly been considered. Too bad for the Caps and hockey fans everywhere. Ovechkin is something to watch. The Capitals public address announcer was a little too crazy for my liking, nothing like a voice cracking at that volume level! I almost forget to add my extra two cents on The Argyle Pub as we went down last week to try some eats and drinks. I wasn't thinking, and forgot my camera. Sorry. The food and drink and service was outstanding. I had the Steak sammy with fried onions and salad. It was perfectly done. Sarah had the Halibut and chips. She said it was the best Halibut she's ever tasted- no lie. To start we tried some of the hot wings. They were OUTSTANDING, but I am a wuss and can't handle the hot stuff. I was on fire for a while there. I strong encourage you to get down there and check it out! At last report, Canada is DESTROYING the Russians 7-0 in the final of the World U18 Championships- IN Russia, no less. Way to go boys! OT Game 7 - WASH PHILLY who are your picks? They call it "the hump," everybody in Port Alberni does. It is east of this central Vancouver Island city, where serpentine Highway 4 — the only road in or out — slithers over an elevated pass in the Beaufort Mountains. To leave Port Alberni for points east like Victoria or Vancouver, you must get over the hump. It was here, one day in early 2006, that Travis Cross failed to make the grade. Life was crazy-busy, over-full of a young man's dreams in various stages of fulfillment. He'd just finished his four-day shift as a Port Alberni firefighter. "My dream job," he calls it, in the city where he was born and raised. He'd said goodbye to his wife, Melissa, his high-school sweetheart and the foundation for all other dreams. His pregnant wife, Melissa. His desire for a family, and the responsibilities that entails, competed this day with a dream he'd carried since he was a scrawny, 77-lb. teen. One day he would take to the Olympics all he'd learned on the wrestling mats of Port Alberni, and he would earn the gold medal. When I read the comment Travis had saying "it takes a community to raise an Olympian", I thought about THIS moment. When Travis returned from the Nationals after booking his ticket to the 2008 Olympics. Enjoy the video. Sorry about the quality, it is from my smart phone. Idiots in Montreal....Happy Earth Day! From the wire this morning.....Idiots in Montreal. Some of the reports I've read indicate that the idiots weren't hockey fans. I sure hope not. .
MONTREAL - Montreal's downtown was shrouded in smoke early Tuesday morning as vandals sprinted to one police car after another setting them aflame. At least five police cars were torched and many others were vandalized long after the bulk of a massive crowd had dispersed after celebrating a Canadiens playoff series victory over the Boston Bruins. While the initial celebration was relatively peaceful, small groups milled on several street corners even as riot police surrounded burning vehicles and firefighters doused flames. Television helicopter footage showed one instance where a pair of vandals lit the interior of a damaged, abandoned police car while a third person recorded the act with his cellular telephone. Police spokeswoman Const. Anie Lemieux said the incidents seemed to be isolated. She could not confirm the number of arrests but several men were taken away in handcuffs, including two who pounded a car with cement blocks. Stores were also damaged. Oh man, what a day for hockey fans as there are two winner-takes-all loser-goes-home match ups. This is what it is all about!!! First off- The great atmosphere at the Verizon Center will no doubt be cranked up another notch as the Washington Capitals host the Philadelphia Flyers at 4pm PST on TSN. Way back on Friday night/Saturday morning I was here on the blog cheering for the Caps to come back from a 3-1 series defecit to get back in the series. After coming back from a 2-0 hole to win Game 6 4-2, game 7 should be a dandy. Secondly- Game 7 between the Sharks and Flames goes at the HP Pavillion in San Jose at 7pm PST on CBC. I picked the Flames to be in the finals, so they better win tomorrow! Either way, it'll be a great day for hockey watching! First ever Game 7 at the Bell Centre, Caps try to force game 7, Ducks Roasted, Flames sizzle, Wings hot. How that for a post title? hahaha. It's probably a nervous day for Habs fans and Bruins fans. Probably more so for the Canadiens fans as they were the team up 3-1 and they were the #1 seed. All the pressure is on the Habs, the Bruins can just play. What a beauty Lucic continues to be. How Carey Price and Tim Thomas react to the pressure will be huge. Should be fun to watch for sure. 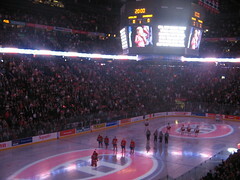 I can't wait to see the atmosphere in the Bell Centre, the first ever game 7 in the building. This is the first game 7 in Montreal in SIXTEEN years, if you can believe it. Here's the last game 7. Bob Cole at his best. Wouldn't DOUBLE OT be something tonight? I'm cheering tonight for the Washington Capitals to force another Game 7- In their rocking Verizon Center- but to do it they need to beat the Flyers in Philly tonight. No easy task.......GO CAPS GO. 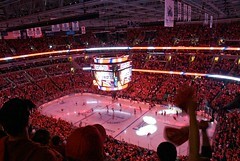 I want these guys to stay around for the energy in their building, and for the joy of watching Alexander Ovechkin play. A little tidbit on the Capitals- I was surprised to find out recently that their owner, Ted Leonsis has his own team blog. I find it darn cool that a team owner would have a blog to address and connect to the fans. Besides Mark Cuban, Leonsis is the only other guy I know of that has one. It is a fun read, with some good-natured ribs at the opposition and stuff to get the Caps fans pumped up. Go to the CAPS WEBSITE and look down the right hand side for the cartoon guy with the sharp goatee (we must go to the same barber) and click on "Ted's Take"
I think Francesco Aquilini should start one, the Nuck fans would love that in light of recent events! There will be a new Stanley Cup Champion after the Anaheim Ducks were finished off by the Dallas Stars last night in 6 games. This will make many hockey fans happy. No one likes a winner, unless it's your team. People may wonder "what happened to the Ducks" My belief is that this is just another indicator of just how tough the NHL is this day and age. 1001 things happened to the Ducks. I don't think it's possible to pinpoint one thing to be the difference as to why they didn't repeat. It is just that tough to do. The 97-98 Detroit Red Wings were the last team to REPEAT as Champs. The Ducks are actually the first team since....I'm not sure when....to win the Cup and make the playoffs the next season. Carolina? Nope. Tampa Bay? Nope- but thank the lockout for that I guess. After doing some research- The Ducks are the FIFTH straight defending Stanley Cup Champion to fail to make the second round. Nice to see the Flames pull one out last night and force Game 7 at the Shark Tank. Was anyone else surprised/let down with the atmosphere (or lack thereof) at the Saddledome? I expected more than I thought was there. Maybe it was the broadcast that made it seem that way. I also haven't been really impressed by the Flames overall pre-game presentation compared to others, but again that's maybe just how it appears to me. Vancouver Island is a far way away from Calgary I guess. At any length- GO FLAMES in Game 7. Too bad for the Nashville Predators and their fans yesterday, as they just couldn't get anything going against the Wings as they lost 3-0 in game 6. So much for my "upset of the playoffs" and "Preds in 7". Maybe if Nashville's biggest highlight also wasn't their biggest lowlight!! What am I talking about? Jason Arnott scoring the second Pred's goal in 9 seconds to win game 3, only to be injured by Alexander Radulov in the ensuing celebration. Or so the speculation goes. The goalie in me said OUCH on that long-bomb game winner by Lidstrom from near his own blueline. BCHL stuff. The Penticton Vees dropped the first two games of the Doyle Cup in Camrose, to they now return home to the "museum" that is the Memorial Arena to hopefully change their fortunes. Good luck to the Vees on bringing it back for BC. The BCHL executives were rewarded for their efforts with new deals on Friday. Congrats to them both. Director Dave Sales have each signed three-year contract extensions that will keep them with the league through the 2010/11 season. 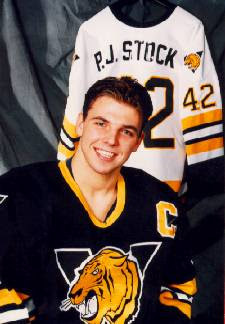 Under the leadership of Grisdale and Sales, who joined the league office in 2003, the BCHL has become widely regarded as the top Junior A hockey league in North America and boasts hundreds of graduates playing professional and college hockey. That's it for today- back tomorrow with some Bulldogs stuff with things on the schedule this weekend with the Spring Camp coming up and the season ticket renewal deadline also on the horizon. Go Caps Go!.... (and Habs, and Avs) plus Doyle Cup Update Vees vs.Kodiaks. I am doing some testing through flickr.com and their "blog this" feature. This picture was found after clicking on "Picture of the Day" on the Caps homepage at www.capitals.nhl.com, so I would assume it is property of the Washington Capitals! And Habs, and Avs today and this evening. Should be a great day today to watch hockey with three games on tap, starting with the Caps trying to stay alive at home as they host the Philadelphia Flyers. After winning game one, the Flyers have won three in a row, including double OT in game 4. I want the Caps to win this series not just because I predicted them to in our in-house 2008 Stanley Cup prediction pool, but because I want them to win for the sake of the excitement factor Alex Ovechkin brings and the fans at the Verizon Center bring. My prediction was CAPS in 7 and it looks like if they are winning the series then I was right on the money. 10am today on TSN or NBC for this one. 3:30pm Pacific CBC's Hockey Night in Canada kicks off with their pre-game show to set up the just after 4:00pm puck drop for the Habs at the Bruins, with Montreal holding a 3-2 series lead. I had the Habs pegged in 5 to win this one, so I'm already wrong. After the 5-1 Bruins win in game 5 I thought two things-Never underestimate anyone's will to keep fighting and not give up at playoff time..... and never forget how important GOOD goaltending is. Carey Price didn't give them that on Thursday. It will be interesting to see how he bounces back today. The late game sees Minnesota going into Colorado to try and stay alive down 3 games to 2. I predicted Avs in 7 in this one. Minny has had some injury troubles, and watching bits and pieces of the last game Jose Theodore appears to be winning the goalie duel. Just an aside for a moment- How many people wrote Theodore off the last couple of years? How many people were kicking him when he was down? Now how many people are singing his praises that he's back and playing great? Not nearly as many giving praise as there were writing him off, that's for sure. I predicted Avs in 7 in this one, so I wouldn't be upset if they didn't get it done tonight.....Of course this pool gives more points for predicting the right TEAM to win and less points for getting the amount of GAMES right. So just don't blow it in 7!! The Camrose Kodiaks took game 1 of the Doyle Cup last night, 3-1. The two teams go at it again tonight in Camrose. Thanks for reading the blog, back to the radio show. PJ Stock on Hockey Night in Canada- Thanks Scott Moore, Rugby Action in the Valley this weekend. If I was coaching the New Jersey Devils or Anaheim Ducks tonight, and the Capitals/Flames/Wild/Bruins over the weekend, I'd be bringing up this little tidbit for motivation. I wonder if any of the hockey broadcasts will pick up on this historical fact tonight? Probably not. Toronto Ontario - Toronto Maple Leafs pull off the greatest comeback in NHL playoff history with their fourth straight win, a 3-1 victory over Detroit Red Wings, winning the Stanley Cup 4 games to 3. Maple Leafs goalie Turk Broda lets in just seven goals in the final four games. Ok- A warning- time for some OPINION. Just mine, doesn't have to be yours. About this time last year I made a big post about the play-by-play personalities on TV. It generated more comments than just about any other post I've had. WHY? I don't know, but I think it is simply because us Canucks take hockey seriously, and how and who we watch it through seriously. "Stocker" PJ Stock as a Junior in the Q. He doesn't look much different now does he? Well, there was a time a short while ago when I didn't think I would be saying this- but MAN is PJ Stock ever growing on me. I've had plenty of people talk to me about PJ's work on HNIC, and most comments haven't been good ones. Just yesterday someone said the same thing- "wow I don't like PJ Stock, he's brutal" What came out of my mouth next surprised me. I said "Ya know what, he's actually starting to grow on me, he at least has personality"
Last night during the Flames vs. Sharks game he was hilarious. You can tell he was a "beaker" back in his playing days (not too long ago) when after Stock talked about seeing "nothing but net" when he scored on him in his playing days, Kelly Hrudey fired back with a shot about his ice time. PJ started singing "I scored on Kelly Hrudeyyyyy....I scored on Kelly Hrudeyyyyy"
I laughed my arse of. Ron McLean asked him when he could work next, and PJ said "Sunday....day of the lord....hmmm"
I like personality when I feel it is GENUINE and not forced and fake. It's all a matter of the viewer and how they read the person speaking to them. In this viewers opinion, PJ seems like the REAL DEAL to me, honest and not forced and fake. And I guess that is why he's growing on me and I'm starting to like the guy. Now, lets be honest here- PJ still needs a little work, and he's still as far as I know a relative rookie when it comes to being on camera and doing highlight packs and doing stand ups. This is where I think CBC Sports Executive Director Scott Moore deserves some credit. CBC is always the most professional broadcast out there in my opinion. All of their on air personalities are seasoned vets, and true pros. In comes Stock, who certainly isn't any of the above. This isn't a slam on PJ Stock. I'm sure the fact that he managed to make the NHL as an undersized scrapper shows that he has the determination to probably one day be a mistake free pro like the rest of the CBC'ers. Right now, he isn't, and THAT is why I think he's there. I certainly can't think for Scott Moore, but I imagine he realized that the broadcast needed a little spicing up and a little personality and fun. Stock brings all of that. Don Cherry can't be everything you know. Think back a couple of years to Kelly Hrudey when he came aboard. He was green and new and inexperienced and made a tonne of mistakes. Now, he's a very enjoyable and very solid part of the broadcast. Ok OUCH reality just smacked me in the forehead. Hey, we can all dream right? 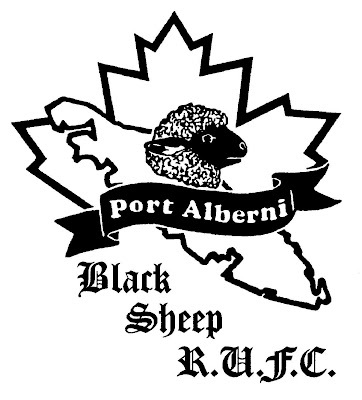 The Black Sheep Rugby Club has an "International Friendly" tomorrow at the pitch at the top of Argyle, as they host a touring side from the SCEGGS Redlands School in Cremorne Sydney, Australia. The two teams have a joint training session tomorrow morning before they kick it up a notch for a match in the afternoon. Kickoff is 2:30pm. You are encouraged to head out and support our Junior players in what should be an entertaining game. Thanks as always for reading. Would love to hear your opinions by way of a comment below. How about my bud Jordin Tootoo- 2 goals in 4 playoff games? The most impressive thing to watch in this series so far in my opinion are those nuts Predator fans! They must have seen some video of the fans at the famous Cornell Big Red Lynah Rink, because they sing all the time in unison with some of the same songs they sing at Cornell, as far as I can tell. I remember their fans singing last year in the playoffs, but not like they are now. The only other place in the NHL where I hear the fans sing as often and in unison as in Nashville is in Montreal. Hands up whoever thought Nashville fans would be likened/compared/linked to the great Montreal fans? Exactly my point. It was cool watching the CBC coverage of Game 4 last night. They came back from a commercial break and said the crowd was just plain rocking for the entire commercial break. Way to go Nashville. You saved your team, and now you are enjoying it. Every hockey/media person and fan in Canada that says US and Southern and non-traditional hockey markets don't deserve a team needs to just watch 5 minutes of a game from the Sommet Centrer. The video evidence is below- check it out. The two goals in 9 seconds was just plain NUTS. Kinda reminded me of the fans at the DOG POUND when Jordin Kremyr scored 2 goals in 22 seconds. Just minutes after the Clippers scored 2 in 44 seconds. I of course posted that 05-06 highlight earlier on the blog this season after Bulldogs alumni Stephen Pattison said it was the loudest he had ever heard the pound in his three years of playing here. Port Alberni's most infamous bar has changed - for the better. The Argyle is now open in the former home of the Pink Panther and the Blue Zoo. The 153 seat Argyle Public House has Port's best collection of Scotch, super fresh domestic draft from across Canada for $3.75 a pint, and, as the website says, (www.theargylepub.com) the Argyle strives to be "A generally good waste of time". Proprietor Rob Boyko is pleased to open a bar with a full pub menu that is built to be a great place for a drink after work, or to bring a group of friends to enjoy live music and dancing on the weekends. Large flat panel tv's, big comfy leather chairs, great bar stools, and a very cool umbrella holder are part of the charm. "The Bar needed serious work when I took it over in November. I think it's safe to say the Argyle now has one of the nicest women's bathrooms of any bar or pub in Port. We did keep the pole for posterity but we prefer our guests keep their clothes on. ", Boyko quipped. The Argyle hosts the BC Amateur Poker League's Texas Hold'em tourney on Monday evenings starting at 7 sharp. Registration begins at 6. Play is free, and in addition to earning points in the BCAP league (www.bcap.ca), there are nightly prizes and promotions. New players to the game of Hold'em are always made to feel welcome. Sunday afternoons the Argyle hosts a two table pool tournament starting at 4 pm - again with interesting prizes and a "beat the champ" format. The Argyle is proud to sponsor the Sunday Mixed Slow Pitch league, the PA Kings, and the Screamers (don't ask). Raising money for charities in the community is important to Rob and the Argyle family. Special events can be held at the Argyle to raise money for your favourite charity - and the Bar always chips in cash for a good cause. The Argyle is looking for great local and regional bands for its Friday and Saturday nights and individual or duo musical talent for Thursday nights. For event information, to inquire about booking a special party or charity event, to book a band or musician, or for employment opportunities please visit www.theargylepub.com or better yet, stop by! Why: Who doesn't want to have a good time? I was lucky enough to get a "sneak peak" in the pub last week. Trust me, you wouldn't believe it was the same place. I will check it out for real and take some pictures for the blog if I'm allowed. I will for sure post a review on the food and drink too! Some of you may wonder why I post about this stuff. It's simple really, I just like to promote new businesses in town that I know will be sports oriented and community oriented. It did the same thing when Boston Pizza opened. There's no perks in it for me (at least there hasn't been yet) but that's not why I do it anyway. Movin' along- My thanks goes out to Perry Elderbroom at GOLD IN THE NET for inviting me to be the MC for their Golf Tourney coming up in May at Morning Star Golf Course. It should be a good time, and it's for a great cause- the Aaron C. Cornwall Memorial Scholarship Memorial Fund. I encourage you to sign up and get over there to hit the links- see the information below. Bulldogs 08-09 recruit Frank Slubowski is of course a GOLD IN THE NET product. Sens first team to bow out of playoffs as Pens move on, MINI KIPPER, A new business for Port Alberni. Just finished watching the Penguins eliminate the Ottawa Senators in four straight games. While it was a bit of a shock throughout the season as the Sens tail-spinned, this series loss wasn't shocking at all. Credit for this great find goes to a great blog I discovered in the good ole' U S of A. Truthfully, they discovered me. Long story. Anyway- check out Ranger Pundit for more Big Apple Hockey Talk than you can probably handle. An incredibly well put together blog. Ranger Pundit was where I found this very cool video today- Kipper Kid.....This was me way back when. Not at the rink, but in the basement and on the lake. Neat stuff! Be sure to check the blog tomorrow for news on a new business opening it's doors in Port Alberni, and also some talk about.....GOLF? Yes, GOLF. And no, no for the sake of the Sens, but for the sake of a couple of great causes on Vancouver Island. Could Brian Burke be Vancouver bound? I sure hope so- I've said it here before- I think he's the biggest beauty in the league. I'm always impressed in this day and age of sports media when something this big actually comes as a shock, and not something that has been leaked for weeks in advance. Maybe that sheds some light on how quick the decision was made? Sean Avery swash-buckles Martin Brodeur, Milan Lucic runs show. Just a couple of thoughts as I am currently enjoying Montreal vs Boston, and during commercial breaks New York vs New Jersey. First off- Holy smokes, am I ever impressed with former Vancouver Giant and Memorial Cup MVP Milan Lucic. I never imagined him getting first line minutes, but with the way he has been playing he certainly deserves it. Huge credit to the player, and huge credit to the coach- as Claude Julien has certainly recognized Lucic's play. He has done everything- scored a goal, had a couple other glorious chances, and of course he's hitting everything that moves. Reminded me of this shift from the Memorial Cup Championship game last May. Yes- don't forget, this guy is just 19. NINE TEEN. Wow. During a TV timeout from the Habs vs Bruins game, I switched to TSN to catch the VERSUS Broadcast of the Rangers hosting the Devils. I caught a replay of Sean Avery doing something I have never seen before. I'm no Scotty Bowman, but I HAVE seen plenty of hockey- just like almost everyone who reads this blog. The only way I describe Avery's actions would be swashbuckling. He waved his stick high over his head, in Brodeur's face to try and distract him. It appeared to work, as Avery immediately scored. I'm not a huge fan of Avery and some of his actions and comments, but this guy is a way better player than I think most people realize. Three goals already in just his third game of the playoffs says it all. This needs no description, but just an encouragement to LISTEN TO IT LOUD.....but only if you can handle it. Danny Gallivan 1917-1993-hockey broadcaster, was born on this day at Montreal in 1917; died Feb. 24 1993. Gallivan called 1900 games in a 32 year career, including 16 Stanley Cup victories for the Montreal Canadiens. 4-1 Les Habs, 11:00 left third period. The crowd sings "Nah Nah Nah Nah HEY HEY HEY, GOODBYE"
It could be the EARLIEST that song has been sang in any game that didn't win a championship. One final thought- How cool was it when CBC showed the face of the Habs Public Address announcer? Being a born bred and raised Habs fan I grew up listening to that voice. That was the first time I can ever remember that he got some "face time" on TV. Very cool, what a great voice he has! ....and then my phone rings. Without even looking I know who it is. The call display confirms- Flin Flon, MB. My dad, Cal Hammond. I answer the phone "yah dad, I'm watching the game"
He responds "Coupe Stanley! Coupe Stanley!" I laugh out loud, and say "wow, gotta love the crowd at the Bell Centre"
He says "I'm gonna write a letter, tell them that a former Habs draft pick wants to watch a playoff game there"
I said "Just tell them that the draft pick's son wants to do the play-by-play broadcast call from a game there!" haha. Someone email this post to Les Habs. Maybe we'll both get our dream! Great job by CBC presenting the game and great job by Bob Cole calling the game. Love the OH BABY! 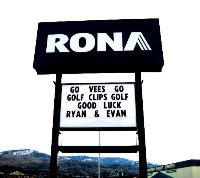 Vees sweep Clippers, local sports stuff, 2008 NHL playoffs! The Penticton Vees swept the Nanaimo Clippers in the BCHL Finals with a 4-0 win last night at the Frank Crane Arena to claim their first Fred Page Cup since 1986. I was a little surprised this morning that there wasn't any mention of the end result on the Vees website or blog or the Nanaimo Clippers website. I'm sure there was some pretty good celebrating going on last night though, and the updates will come when the heads clear. The BCHL website has a write up from last nights game up. The most recent news story on the Vees site from yesterday was about this picture. Pretty funny, but probably not so much if you are a Clipper fan. Congrats to all involved with the Vees organization, but BIG TIME congrats to my good friend Murray Maxwell- the biggest beauty in the BCHL- he's on the Vees staff as an assistant to trainer Alana Dyrland and he has been in Penticton for a long time. He's a great guy and has always been one of the best reasons to play Penticton as we have had some great chats over the years. Shane Power of Lasting Images Photography took this picture last night of THE CHAMPS. Murray is the big guy, back row, far right. The Vees will face either the Camrose Kodiaks or the Fort McMurray Oil Barons in the Doyle Cup Series, with the winner advancing to the Royal Bank Cup in Cornwall, Ontario. I really feel for Clippers play-by-play voice Dan Marshall, losing to his old team in the finals a year later. Having said that, I would bet that Dan is in a better situation now. Too bad Danno, I feel for ya. Local sports. Tonnes of stuff this weekend. I'll be the MC for the Minor Hockey Awards Banquet Saturday night, which should be fun. There's also plenty of hockey action going on at the Multiplex.....When ISN'T there, would be a better question. We know who the REAL Hockeyville is. First- An update on some Female Hockey from Diane Moore- Thanks again for keeping me in the loop! Thanks for all the promo. The Final Chill was a huge success. None of our local teams made it to the finals but they sure put on a good show. We really appreciate the exposure. Our program has come a long way. Our first tournament 5 years ago had 3 teams competing and this year we had 20 teams! We're hoping next year we can get more teams from out of province or even out of country. Thanks again. This weekend BC Hockey High Perfomance will be holding the Female U16 camp here on Saturday and Sunday with games on Saturday night at 6 pm and Sunday at 9 am. Over 50 girls are trying out for the Island Zone U16 team and the Island team will be competing in a BC Zone tournament in Salmon Arm at the end of the month.Four local girls will be trying out - Samantha Campbell, Jordan Dowling, Joanna Neufeld and Samm Moore. Should be pretty good hockey. I hear you are emceeing the AVMHA banquet this year. Looking forward to seeing you there. Now- RUGBY news. Not something I have talked about on the blog before but they are now keeping me in the loop too- cool. Man is that a cool logo. Hey BLACK SHEEP RUGBY CLUB- I want a Rugby Uni or a HAT! Pretty please! Anyway- here's the update they sent me for this weekend- Of course all the action is up at the pitch at the top of Argyle. 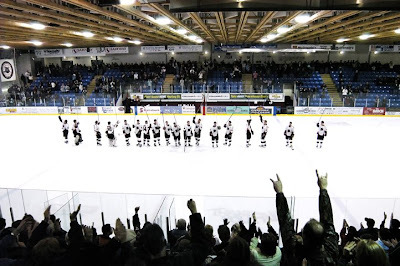 The BlackSheep are home to the Nanaimo Hornets this weekend. Kickoff for the 2nd Div game is 1pm and 2:30pm for the 1st Div game. Come out and support the Sheep in the last regular season game. Everyone is welcome. Thanks again for the update. Man, I'm even talkin' Rugby on here now. Up next- HAMMERS COOKING TIP. Ok maybe not. Unless......If someone donates me a nice cut of meat I'll do up a batch of "Hammer's Beef Jerky" Ask Adam Hout- It's a 13 out of 10- He said it started as a 9, but just kept getting better. HAHA. Last but not least- NHL stuff- not much today, but an incredible video to watch- GO HABS is all I have to say. Man I love the emotion in that building. Second to none. Kinda funny to watch the video now, as they are talking about Cam Ward making his first playoff debut. NO ONE in the world would have believed at that point that he wouldn't look back all the way to the Conn Smythe Trophy. Sure enough- that's what happened. Point is- Expect the unexpected. Pay special attention to the Montreal fans after the puck drops- Sorry, it's near the end of the video. How they CHEER and BOO so fast when the Habs have the puck and the Canes have the puck is incredible. Like a soccer match. Can't wait for tonight! And WHY is CBC the best? Because they take you into the rink and show you so much of the pregame stuff. You get a feeling for the atmosphere and the emotion. I'll take that any day over TSN who just shows more panel discussion leading up to puck drop. (DONT WORRY ONLY 60 SECONDS OR SO ARE IN FRENCH) The video is best view with your speakers/head phones LOUD- listen to the roar of the crowd when the flag bearers come out, the pop when the team hits the ice, and the roar every time a player is introduced. That's it for today, thanks for reading! Great news came down from the Bulldogs last night as they announced that Jackson Garrett has committed to play with them next season. The thought of this guy playing with the Dogs excites me, big time. He was very dynamic playing with the Bulldogs as an AP in Powell River for game 60- scoring a beauty goal, and adding a nice assist. He'll be a beauty in my opinion. I think it says something about the Bulldogs personnel and the quality of their organization right now that they have landed a player like Jackson. I'm by no means in the know, but with his numbers and size, he had to have plenty of teams clamouring for him to sign with them next season. The only thing more shocking than the Vees taking a 1-0 lead 30 seconds in would have been when they made it 2-0 just over a minute later. WOW. How can you argue that the Clippers weren't ready, or at the very least, no where near as ready as the Vees were? It's a team game, so I don't like to lay blame. Especially when I'm not close to the situation. Is it coaching? Leadership? From 200 feet away, the second Penticton goal seemed like a stinky one. Don't blame Michael Garman for the loss though. In my head I had "turning point of the series" noted as he made a HUGE save off a rebound right in front just seconds after Nanaimo had battled back in the first to make it a 2-1 game. I thought that if Nanaimo swung the game around that one play might have been the one. The second played out much like the first in my opinion- the Clippers not skating especially well, and not bringing much of a physical element. The Vees added two more to lead 4-1 after two. Big credit to the Clippers for coming out and showing the heart they did in the third to make it a 4-3 game with just under three minutes left. If the Clippers of the third period had been there for the first two periods, I think the game might've been much different. Credit to Alex Evin for coming up with one big toe save with about two minutes to go to preserve the lead. The Vees played a solid all-around TEAM game. No one really stood out for them to me, they just appeared to be all on the same page. An odd play in the second period occurred when Clipper Captain Matt Irwin went down hurt behind the play. I didn't see what happened to him (once the puckwatcher, always the puckwatcher) but it looked like he might've been cheap-shotted to the second most important cup in hockey. If you get my drift. What made it really weird is that the Vees came up ice on a 2 on 0 with Irwin still down. He staggered to his feet to make an effort to break up the 2 on 0. Certainly odd. If I was on the Clipper side of the puck, I would've been screaming for a whistle at that juncture. Knowing the rules, I know it's not supposed to be blown until the Clippers have posession. Which they didn't. Of course discretion allows the official to blow play dead if he believes the player to be in immediate need of medical attention. What really made me wonder was this: Were the linesmen consulted afterwards? Did anyone see what happened behind the play? Since linesman can assist the referee in calling double minor and major penalties, what would've happened if the Vees indeed scored on their odd man rush, BUT, one of the linesman indeed spotted a double minor or major infraction on the incident? Does the goal come back and do the Clippers go to the power play? Indeed odd, and I'm sure ANY team in that situation would've felt like they were getting jobbed. Dan Marshall and Marlow Weldon said it best on the Clippers post-game show on 106.9 THE WOLF last night- You can't win four games tomorrow (today), you can just win ONE and that needs to be the Clipper focus. I don't agree with the belief that you need to go back to Michael Garman, but opinions are like a$$holes, everyone has one! OK, NHL playoff predictions....Never before have I had such a tough time looking at the match ups and picking the winners. I'm going with my guts and instincts mostly. And a little with my heart. Stanley Cup Champ- Montreal Canadiens over Calgary Flames in 6. I picked the Habs as Cup Champs back around Christmas when 93.3 The Peak news man Rob Diotte asked me who the champ was going to be. Oddly enough, I picked the Habs then based on the strength of their goalie tandem of Huet and Price. Now, I'm going just on Price I guess. Food for thought- The last TWO Cup champs relied big time on the goalie that they didn't think would be their "guy" You could even make that argument about the last four Cup Finalists. 2006- Cam Ward takes over from Martin Gerber in game two of the first round vs. Montreal. He doesn't look back en route to the Conn Smythe. Don't forget that Dwayne Roloson went down for Edmonton in Game 1 of the finals- to be replaced by Ty Conklin and then Jussi Markennen. Last year, the eventual Cup Champ Anaheim Ducks started the playoffs WITHOUT J.S. Giguere. The Ottawa Senators began the season with Martin Gerber as their #1 "tendy" but Ray Emery ended up taking them to the finals. Habs in 5. I'm not sure the Habs are tough enough to win it all, but the Bruins simply aren't good enough to stay with them. UNLESS Thomas gets red hot, and Carey Price face plants. Pens in 6. For all of Ottawa's problems, I don't think this will be as easy as some think. The Senators will be loving the chance for a FRESH START, as they have been tail-spinning since November. This one just reeks like an upset to me, but not without Alfredsson, Kelly, and Fisher. PREDS in 7! My upset of the playoffs. GO TOOTS. Who knows, Wings could just as easily win the Cup. Flames in 6. Battle of top guys vs top guys I like the Flames better. I have a tough one with this series. I like Minny's team, and especially their toughness, a playoff must. Backstrom in goal just doesn't do it for me. Theodore is back from the dead and playing better.....Avs in 7. But I also feel like Minny could win it all. Wow, what a series this one will be. Whoever gets better goaltending in 7. But that isn't a prediction is it? With the way Dallas has played lately, the Ducks could walk over them. I think the Stars will come together to make this a series. Ducks in 6 though. Edmonton Alberta - Oiler Wayne Gretzky scores 7 goals in a Stanley Cup game for the third time; passes Jean Beliveau as all-time playoff scoring champion. PLEASE REMEMBER PEOPLE. TODAY IS A VERY IMPORANT DAY IN OUR COUNTRIES HISTORY. Vimy France - Arthur William Currie 1875-1933 leads all four divisions of the Canadian Corps. fighting as a unit for the first time, with one British brigade under Lt.-Gen. Julian Byng, to Easter Monday victory at Vimy Ridge. Using 1,000 guns and a masterful artillery barrage technique developed by Currie and his gunners, they take the German stronghold where the French and British had earlier failed; 4,000 Canadians killed, 6,000 wounded. From that day onward, Germany is on the defensive.